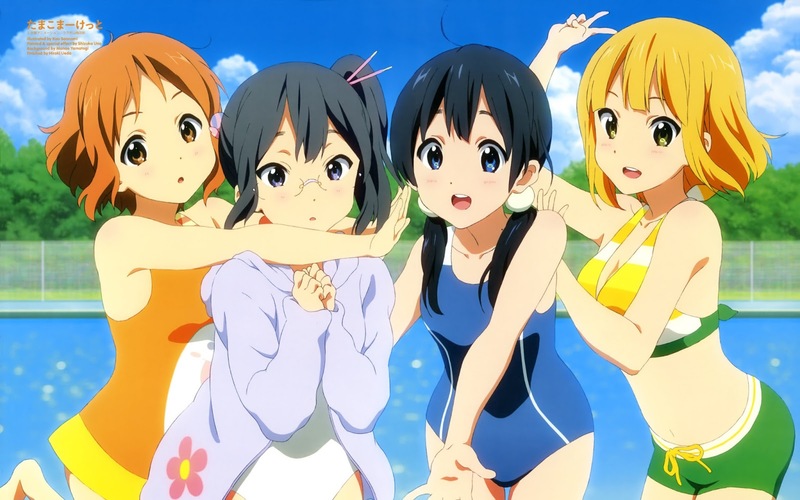 Posted on March 28, 2013 by Lena K.
Tamako Market is an anime series produced by Kyoto Animation that aired between January and March of 2013. It has a total of 12 episodes and has already been licensed by Sentai Filmworks. 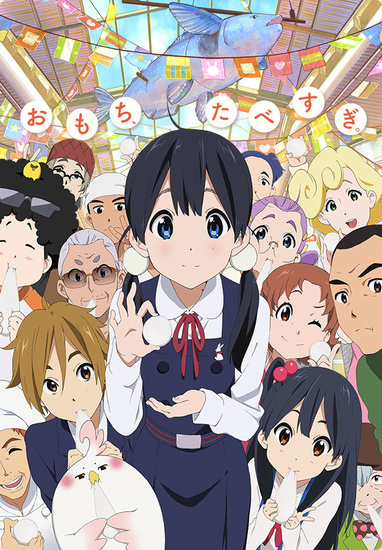 The story revolves around Tamako Kitashirakawa, a normal high school girl that’s working in her family’s mochi shop. She enjoys her everyday school life with her friends, the work in the mochi shop, and in general, her life as a member of the town’s shopping district. One day, an unexpected guest arrives, Dera Mochimazzwi, a talking bird, a royal one on top of that. Dera arrives from a faraway place to announce his plan of searching for the perfect bride for his prince. Finding a liking to the Kitashirakawa family, and most of all to their mochi, Dera ends up staying a little longer, becoming a freeloader in their home. Sounds a little weird huh? It’s actually a very odd mix of a totally normal group of friends enjoying their everyday school life, and a totally unusual talking bird on a royal mission. But as crazy as this combination may sound, it is first of all, very enjoyable and interesting to watch. Let’s be honest, you don’t have to think about much watching this anime. I would even say you can just shut off your brain and watch this without thinking about anything at all. And since this is like 80% of Tamako’s normal school life and 20% bossy bird talking and eating mochi, this is like the perfect show to watch in between those ones that you need to actually pay close attention to. She is the protagonist of the anime and the oldest daughter of the Kitashirakawa family. Since her mother passed away when she was still little, she is now living with her younger sister, her father, and her grandfather, working in their family’s mochi shop. While Tamako is hardworking, always helping out in the shop, and in general, the portrayal of the perfect daughter, she can at times be a complete airhead that is totally oblivious to her surroundings. As an attendant, but primarily a member of a royal family of a faraway tropical island, Dera is ordered to find his prince’s bride. 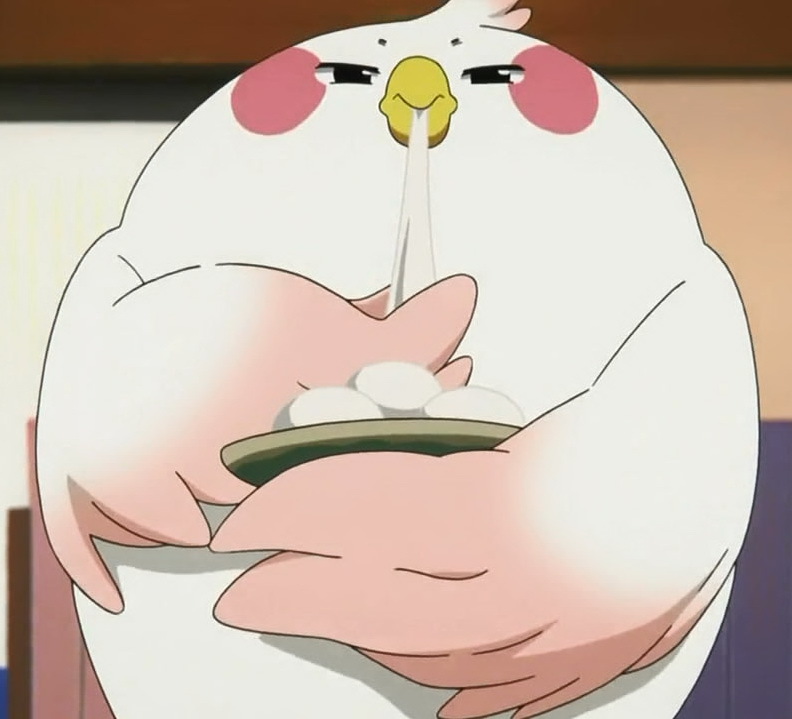 Being a bird, he’s the perfect choice for this task, but as soon as Dera gets to know Tamako, and of course her delicious mochi, he quickly gains some weight and is hence unable to fly for too long. As the noble bird that Dera claims to be, he tends to act a little bossy and commanding around everyone, even though he is never treated with the respect he would want to be treated with. There are many more important characters, each and every one with a very unique personality. I would even say that the presentation of the characters is one of the strong points of this anime. We got a proper introduction of almost every (important) character, each one of them got their own background story and enough screen time to make their character look appealing to the viewers. When first seeing a clip of this anime online, I was mistaking it for K-On! and you have to agree, those two shows look very much alike, probably because they are both produced by Kyoto Animation. 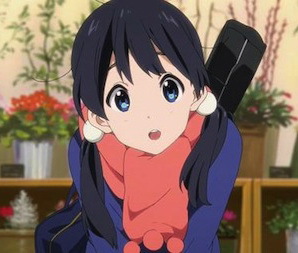 In my opinion, the animation, just like in K-On!, was very well done. I kind of like the cute artwork, those big eyes, round faces, and adorable expressions. What’s the word they used to describe K-On!? I think it was “moe”, which basically means something like “the ideal of youthful and innocent femininity”, and that’s exactly how Tamako Market presents Tamako and her friends. See for yourself. While I think the opening theme, Dramatic Market Ride by Aya Suzaki, was not that catchy, it was good nonetheless. The ending theme, Neguse by Aya Suzaki, left a much bigger impression on me. It doesn’t often happen that I really listen to the ending of an anime, but this one is really catchy. For the background music, I can’t even tell whether this show had any kind of background music at all, other than the songs they played in the little record store. I guess this means the background music wasn’t that impressive, but on the other hand, I can’t recall any moment in which I was bothered by the music as well. 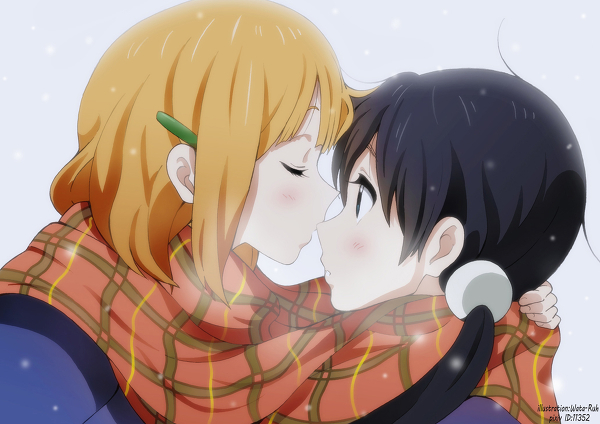 Tamako Market is far from being a masterpiece, but then again, I don’t think it aimed to be one to begin with. It’s a light comedy with an overdose of cuteness put into each and every episode. In addition to that, it’s also very simple, and all in all, a nice anime to watch, especially when you are a fan of cute girls doing cute things. 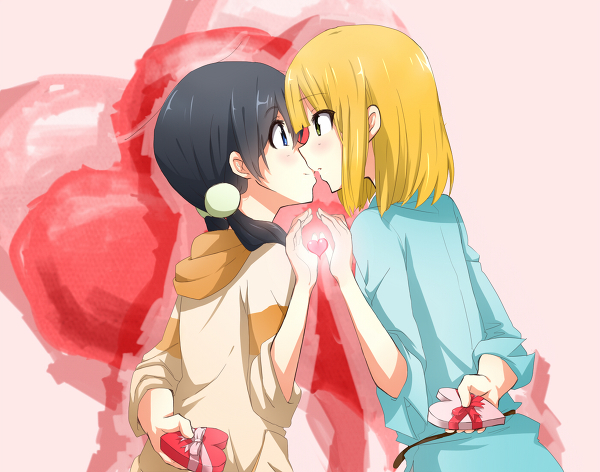 This entry was posted in Anime, Anime Review and tagged Tamako Market by Lena K.. Bookmark the permalink. For an SoL veteran such as myself, this was underwhelming. However, if you're not an SoL connoisseur, it should somewhat please you. Oh well, thank goodness for Midori, like her or not. I've read that pretty often, I guess I'm not an SoL verteran then or maybe my vision was affected by all the cute girls. Ok wait not all of them were cute, mainly it was just Tamako, Midori and occasionally Shiori. How odd. I'm a total crazy SoL fan. I quite enjoyed this one. Of course, my forte is SoML (Slice of moe life), but I still most certainly enjoy stuff like Usagi Drop or Toradora. At least the show ended without crushing any possibility of a Midori end, like a lot of shows will do. I was really happy about that as well, but unfortunately Tamako doesn't seem like the person to fall in love soon. But maybe there will be a second season? I don't really know why this got such a bad ranking and why so many people in general didn't like it that much.